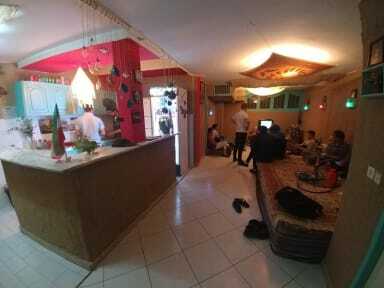 Tehran Mori Hostel, Tehran, Iran : Rezerwuj teraz! I was already at this hostel two years ago when it was at a different place. Now the location has changed and it is very good (close to the red metro station, convenient to go anywhere). Mori - the owner is a great easygoing man and the reason I came back to his new place. He makes the atmosphere very friendly and chilling. It's great to see how he cares for the business and how it is growing! Thanks again! Nice backpacker vibe, a garden with a hammock, kitchen with supplies of tea, and a little happy dog you can play football with. The hostel is run by a very friendly family. They are helpful and nice. Location is very good. Cleanness is really below standard, the hostel is messy and cleaned rarely. I also did not like many notes placed on the walls directed to visitors e.g. panelty for not locking the main doors, the internet password is 'MakeYourPaymentFirst', and many more, it feels unwelcoming. 24 hours reception doesn’t exists. Breakfast are really small and not tasty. I was waiting 2 hours to tell with reception man (till midnight when I riding stand and go to sleep) who was talking by phone. Horrible.